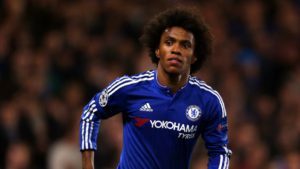 Manchester United have had their bid for Willian accepted by Chelsea, according to a recent report from Manchester Evening News. Mourinho, who worked with Willian while Chelsea’s manager a couple of seasons ago, has made the Brazilian his topmost priority; and the accepted bid was an audacious €75million (£66.5 million). The deal was reportedly agreed upon by the Stamford Bridge owners because of a dearth of funds at their disposal; and the wide man is 29 with little sell-on value. New Chelsea manager, Maurizio Sarri is willing to sacrifice the ex-Shakhtar man to improve his budget, thus enabling him to secure more signings after the acquisition of Jorginho. This is after it was reported that the new Chelsea gaffer was unwilling to listen to offers regarding Hazard and Courtois, who have been linked with moves to Real Madrid in this window; therefore, he has to dispose of one player and from their point of view, Willian wouldn’t be quite as much of a loss. Barcelona were also keen on him, but the capture of winger Malcolm from Ligue 1 has however put Manchester United at the forefront for Willian’s signature. It has also been rumoured that we are interested in 24-year-old Croatian midfielder, Ante Rebic. The explosive midfielder gave a good account of himself at the World Cup in Russia, with his selfless running of the channels and willing to stretch play by running in behind. To this end, his German club might be willing to do business if the offer for him is irresistible. The transfer market is counting down and clubs are eager to get their businesses completed before it closes in August and reopens in January of 2019.